The holidays are upon us! Do you have someone with low vision from macular degeneration in your life? Or wondering what to put on your own wish list? Finding a gift for someone with vision loss from macular degeneration may at first seem like a challenge, but there are some really great products that are sure to bring a smile. When people start to lose their vision, other areas of their life are affected, like independence, mood, and cognitive stimulation. AMD patients can suffer from loss of independence, depression, and cognitive decline as a result. We wanted to create a gift guide that honors the unique needs of people with AMD while being fun, innovative, unique, and inspiring. While there are plenty of low vision products on the market, these are a few of our favorite things. Did you know that the loss of one of our senses is linked to cognitive decline? Help your loved one stay sharp with these gifts. Audio Book Subscription For the AMD person in your life who is struggling to read print, an audio book subscription will let them enjoy listening to their favorites. Make sure they have a device they can listen on. Why we love it – well, mostly because we’re a bunch of readers ourselves! 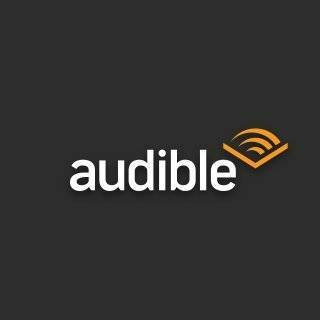 Where to get it – Audible is one of the more popular audio book subscription services and you can sign up here. 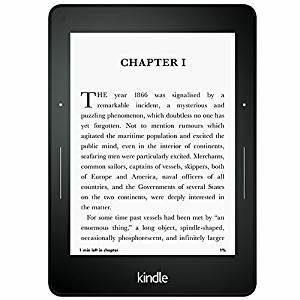 Kindle – the kindle is a lightweight, no-fuss electronic book reader. Why we love it – Kindle was already a good choice as a reader for low vision, but now they offer specific accessibility features for low vision like the voice-view screen reader, larger font sizes, contrast options, and more. Not to mention, no blue light! Other ideas – large print word and number games like crosswords or Sodoku are often available in large print versions. Great stocking stuffers! Shrinking independence can be one of the most frustrating aspects of vision loss. Give a gift that helps maintain or extend independence and you’ll be sure to make it onto the nice list! Amazon Echo – a “hands-free speaker you control with your voice” to play music, get news, sports, weather, and more. Connection to other smart devices opens more potential. Why we love it – Another Amazon product? We know. But Anna Schaverian said it best in her review of Amazon Echo for her blind father, “Being blind in a world of screens makes you feel like you’ve been left behind.” We’re happy that tech is evolving beyond screens so the visually impaired can get some use out of it too! Where to get it – click here to go to the Amazon page. Brightech LightView Pro – Designed for aging eyes, this professional-quality 42-LED floor lamp boasts the largest available magnifier lens, made of authentic diopter glass, with a 15″+ focal range. 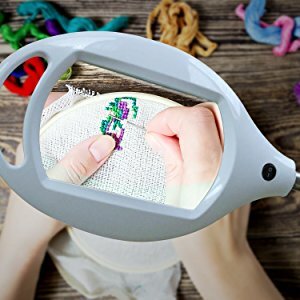 Why we love it – Lighting and magnification are two of the best tools that allow for the continuation of daily activities and hobbies, and this provides both in one tool that adjusts to different heights for different situations. We haven’t yet tried it, but one of our staff members ordered it for her mother for Christmas based on positive reviews. Where to get it – direct from Brightech’s website here. Along with maintaining independence, people with vision loss from AMD need to stay social to ward off isolation, but not being able to participate easily in things can be an obstacle. These two gifts, one fun, and one practical, are great isolation busters, AND when you purchase either of these gifts, a portion of the proceeds go to AMDF to support our mission. Big Letter Bananagrams – Fast-paced word game with 50% larger letters for people with low vision. Why we love it – Because this version was inspired by a Bananagrams fan with macular degeneration! Also, because our own Paul F. Gariepy can play without his magnifiers, and we tested it in the field and it was a hit with 4 generations at a family Thanksgiving gathering (you can read the whole story here). 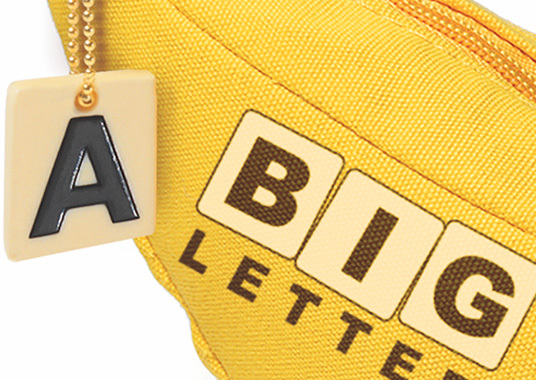 Where to get it – Big Letter Bananagrams is available on Amazon. Tip-n-Split – This handy device is a magnifier, light, and calculator rolled into one. 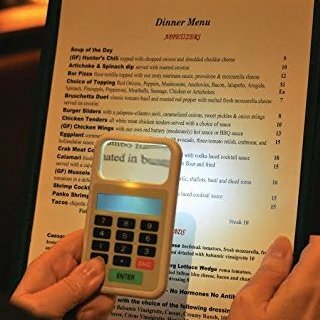 Why we love it – Restaurants are the WORST for the visually impaired with their dim lighting and small print menus. This device is more discreet than a smartphone, pocket-sized, and super easy to use. And you can read about the founder’s story here. Where to get it – You can order the Tip-n-Split here. 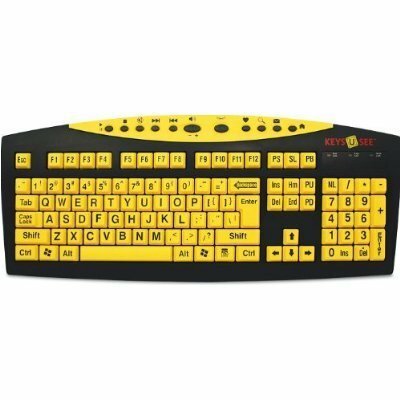 Low vision keyboard – large print, high contrast computer keyboard designed for the visually impaired. Where to get it – you can find this one on Amazon here. Happy Holidays from all of us at AMDF! Sometime ago I sent a question about an eventual alternative to eye shot x a retina damaged by diabetes. Have not rcvd a reply. Pls ack my request. Thanks. Marina, sorry to hear we missed your contact. We’ll send your contact information on to the right person and someone will get back to you in a few days! This list is so cool. Nice to know there are products out there for people with vision and aging eye problems not just macular degeneration. I have premature cataract and classic loss of short sighted vision However as a society we are going to live longer and deal more with aging issues which don’t have to be painful or obstructive to living fully. Thank you for this an all you do. Thanks for stopping by Rani, and glad you enjoyed the list. Indeed these products would be great with anyone with vision loss from any cause. We read somewhere that accessibility and inclusiveness are going to be a design trend in 2018, so maybe we’re about to see a shift! I have macular, and still use readers. My senior friend when I first met her could slightly see and now blind. The Amazon Echo would be perfect for her. I can’t wait to tell her and her daughter. Did you find something to help the blind use the telephone? We haven’t ordered from this company before so we don’t have any insight about their services, but just from looking at the site they do a nice job of organizing products and carrying multiple options. I HAVE TWO ECHO AND ECHO DOT . THEY ARE WONDERFUL AND HAVE HELPED ME SO MUCH……… EXCEPT I NEEDED SOMEONE TO INSTALL THEM AND HELP ME PROGRAM ALXIA.. INSTRUCTION WERE TOOOOOOOOO SMALL. I FIND THAT ON MOST PACKAGES. 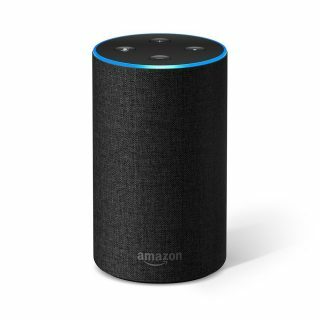 SO REMEMBER IF YOU BUY AN ECHO FOR A FRIEND YOU NEED TO HELP THEM INSTALL IT. Thanks for sharing your experience and the tip Patricia! Hi Bettie — When my father lost his central vision to macular degeneration I bought him a Jitterbug cell phone. With some training, he could make calls, which was amazing because my father, who passed away 9 years ago, was afraid of anything technical. The basic flip phone model was best for him because he could feel around the large buttons on the dialer. The Jitterbug is much more than a phone. It comes with services that allow you to have an operator dial for you, or locate you and send help, or remind you of when to take medications, and a lot more. I am not a representative for Jitterbug, so I am not trying to sell you one. It might work for your friend; it might not. But it’s worth investigating for all of the features it provides for seniors. If she understands how to work a cell phone, she could probably use it. There’s no contract, so you can cancel anytime. The plans are flexible and affordable. And you can probably buy one used on eBay or Amazon. Thanks for these suggestions. We already have Tip & Split. Big Letter Bananagram is arriving this weekend. Your suggestions help my 95 yr. old Mom to stay engaged. I find this dialogue so helpful ! I’m 50 and losing my vision with wet AMD. I am trying to stay self sufficient. Blue and violet light is extreamly painful. I can find glasses that filter these spectrums but are contact lenses available as well? If so where? JoAnn, blue filter contact lenses are available, but you would need to see your eye doctor about them to get a prescription, and consult with them about any benefits and risks and if they’re right for you. Also, check out Dr Mercolas web page, I think he had links to glasses that address this. I am going to order the lamp and magnifier! That should make clipping my toenails much easier. Bifocals just don’t work. Gretel, clipping toenails and probably many other things! Good luck! Are blue blocker coatings on everyday glasses good, bad, or not necessary? I am in the drusen stage of AMD. Has anyone heard of a Mah Jongg set for people with Macular Degeneration? Am in my early 30s and was diagnosed with macular degeneration. I dont drive because my vision does not meet the required guage to pass the vision test. My vision scores at 20 50 on one eye and 2070 on the other , are there special devices that could help me become roadworthy, I need to drive to gain my independence. Its hard and costly to rely on uber and friends’rides. Do you have a post where I can meet others with MD? I was on one years ago but lost touch with it and I cannot find it anywhere. I would like to talk with others; share recipes, anything that helps us deal with this disease. Susan, we don’t currently have a support forum, but we are looking into it! Previous Previous post: What Does Bananagrams Have to do With Macular Degeneration?